GORHAM—Upwards of nine SMAA schools converged on USM’s Costello Sports Complex around midday on Saturday, Feb. 2 for a huge meet, one last regular-season dustup as the championship stretch arrives. Teams from Bonny Eagle, Gorham and Windham all participated. 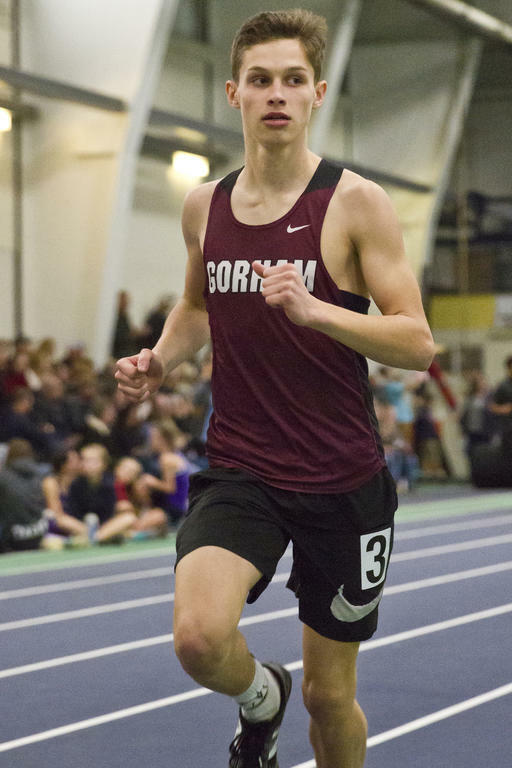 Among the standout performances by local athletes: Gorham freshman Andrew Farr annihilated his competition in the boys junior division 200, besting second-place finisher Josh Sewall of TA by more than two seconds. Farr likewise turned in a superb time in the junior 400, where he led No. 2 finisher Sam Kovacs of Bonny Eagle by more than four and half seconds. Farr’s 200 number was better than the winning number in the same event in the senior division, and his 400 number would’ve had him second among the older boys. Farr isn’t quite setting Conference records yet – but he could start at any moment. Over on the girls’ side of things, Gorhamite Kate Tugman turned in outstanding times as well, finishing two and a half seconds ahead of her nearest opponent, Windham’s Morgan Colangelo, in the senior division 400 and more than 1:16 ahead of her nearest opponent, Bonny Eagler Amelia Alexander, in the open division Two Mile. Landon Bickford competes in the Mile for Gorham. Ella Dunne competes for the Scots. Hannah Langstaff competes for Windham. Delaney Hesler runs the Mile. Ken Beaumier runs the Mile. Carly Witherow competes in the 600. Sam Cole competes in the Triple Jump. Lydia Drew runs the 4×200 for Gorham. Tavi Anghel runs the Mile for Windham. Bonny Eagler Zack Allocca is among the State’s best jumpers. Anthony Mason competes in the Mile. Quentin Riiska runs the 200 for Gorham. Aaron Farr – just a freshman – is quickly rising up the ranks of the Conference’s top sprinters. Molly Black runs the 600. Hailey Applebee runs the 600. Hunter Vail competes in the Mile.